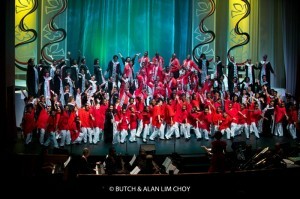 Last year’s fundraising concert series offered “A Prayer for Peace”. 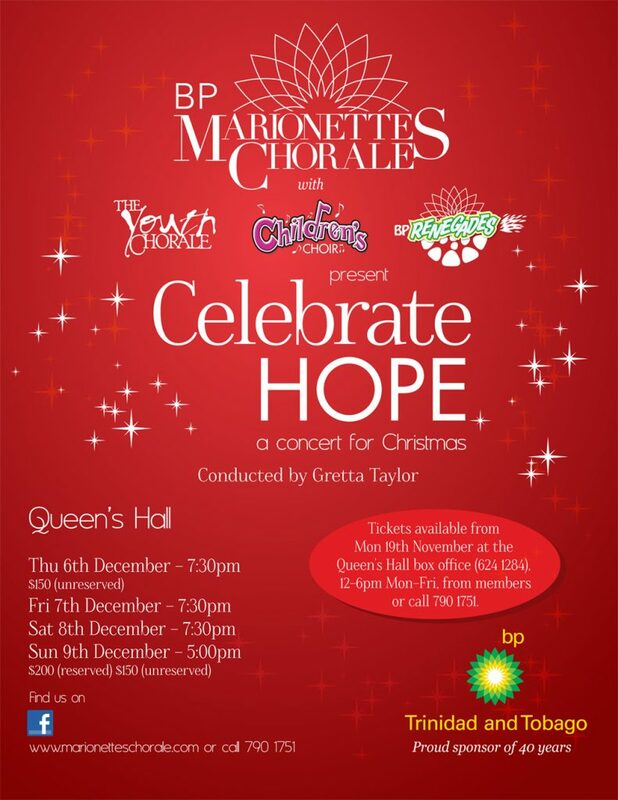 This year, the Marionettes “Celebrate Hope” alongside sister organisation the bpTT Renegades Steel Orchestra! Tickets for this anticipated concert event go on sale from members today (Sunday 18 November), and at the Queen’s Hall Box Office from tomorrow, Monday 19 November. “Celebrate Hope” continues in the vein of the group’s last two series, both of which emphasised the need for peace in our land and the role each of us can play in achieving it. Their mid-year “Gift to the Nation” also showed how bright both the Marionettes’ and the nation’s future can be with the introduction of the 50-strong Children’s Choir, featuring talented performers as young as six years old. There was no doubt that they stole the show. Next month, audiences once again can look forward to the Marionettes’ now three choirs making beautiful music with the Renegades, and weaving the Yuletide theme through a mix of classical, spiritual, jazz, reggae and calypso with Christmas and soca parang favourites. The talents of some of the nation’s best-loved soloists will also be on show: Jacqueline Johnson, Hermina Charles, Diahann White, and several adult ensembles, alongside young soloists Dominique Akal, Sharissa Camejo, Chereeme O’Shaughnessy, and Annalise Emmanuel. 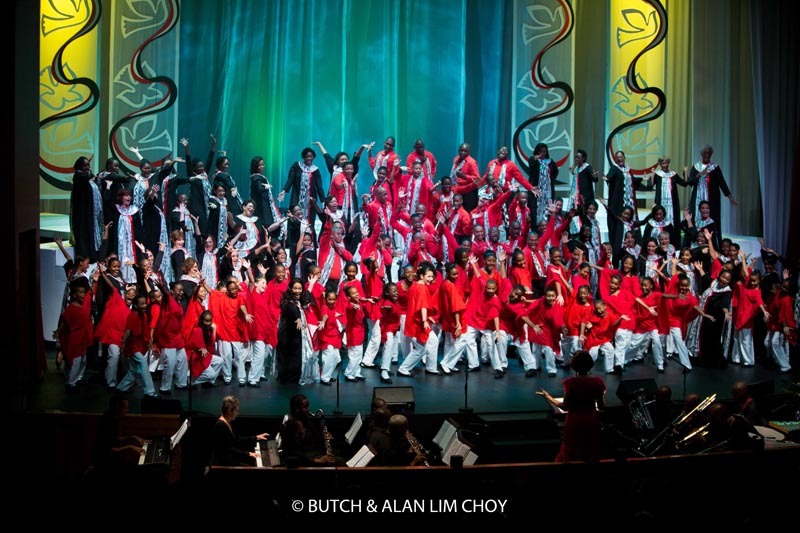 With this Christmas series, the choir also reintroduces audiences to Dr. Roger Henry, a long-time Marionettes member and soloist who co-adjudicated the last T&T Music Festival. Now back in his homeland, he re-joins the Marionettes as a chorister and as new Assistant Musical Director, working with a robust, multi-generational artistic team comprising Artistic & Musical Director Gretta Taylor; Assistant Artistic Director Caroline Taylor; and repetiteurs Jane Carter and Darren Shillingford. Partnering with the Marionettes on “Celebrate Hope” is their ever-faithful and decorated production team including Noble Douglas, Margaret Sheppard, Randy Halfhide, Celia Wells, Franklin Agarrat, Leslie Clement, and Desmond Waithe. “Celebrate Hope” runs Thursday 6 through Sunday 9 December, with shows 7:30pm Thursday through Saturday, and 5pm Sunday. Tickets Friday–Sunday are $150 open and $200 reserved, with specially priced $150 (sit anywhere) tickets for the opening Thursday night only. Tickets go on sale Monday 19 November from the Queen’s Hall Box Office (12pm–6pm, Monday–Friday, tel: 624-1284); and from members of the Chorale (790-1751 or email@marionetteschorale.com).